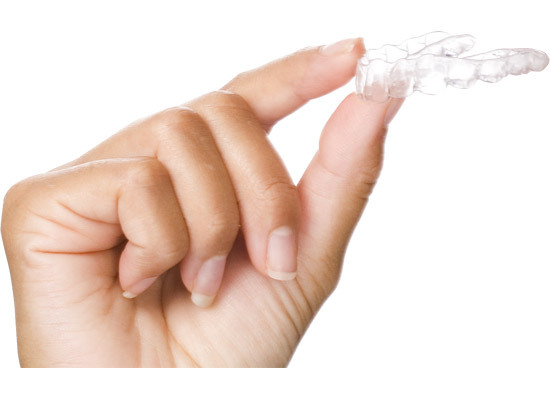 Sequential clear plastic aligners can be a good orthodontic option to correct mild to moderate levels of dental crowding. Clear aligners work like any other orthodontic appliance; they apply pressure that gradually moves the teeth and re-shapes the supporting bone. Your dentist will examine the position of your teeth making notes and taking measurements, photos of your face and teeth are commonly taken for records, x-rays may be required and finally an impression of your upper and lower jaw is needed. The dentist creates a prescription for how the teeth will be straightened and submits this to laboratory which will make the aligners. Based on the impressions taken 3-D models are used to make the clear plastic trays which progress from crooked to straight teeth. The patient snaps the aligners over the teeth and wears them all day and all night, taking them out only to eat, drink and brush their teeth. The aligners are clear so most people don’t notice them and so your teeth can be straightened discreetly and conveniently during the treatment period. Each aligner applies gentle and consistent pressure to certain teeth pushing them closer to the desired position. For treatment to be successful it is critical to wear each aligner for at least 22 hrs every day. It is possible that clear aligner therapy increases the risk of decalcification of the tooth enamel, causes inflammation of the gums during treatment which usually resolves upon completion and leads to irritation to the soft tissues as the plastic aligner rubs against them. Clear aligner therapy requires a high standard of oral hygiene, may require a reduction in the intake of foods/drinks containing sugar and the use of topical fluoride products. Visit Clear Correct to learn more.